Saudahallen is Sauda’s venue for exercise and well-being. 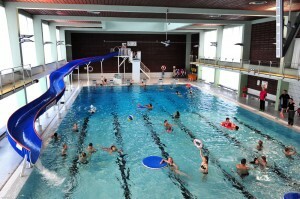 In the swimming hall, there is a 25m pool with a waterslide, diving board and other equipment. In addition, there are two smaller pools. Saudahallen is closed in the summer. Visit Sauda municipality website: www.sauda.kommune.no for detailed opening times, prices and information. Storemyr is a refreshing and lovely mountain-water cove in close proximity to the idyllic Åbødalen, just north of Sauda City Centre. The area offers a lovely sandy beach, good parking, tables and benches, dressing and sanitary room. Great area for a combination of cycling and walk-abouts. Rødstjørna is easily accessible in Saudasjøen. The lake is an official swimming and bathing place. A toilet is conveniently located nearby. The lake itself is within walking distance to hiking paths in the area. Sauda Golf Club’s new golf course is close-by. 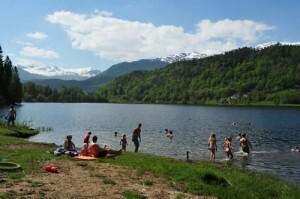 The water in the lake Rødstjørna does not take long before it reaches a comfortable temperature. 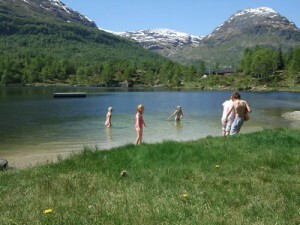 The beach by the camping area in Saudasjøen is one of the few sea beaches in Sauda. Lovely rocks and great bathing possibilities. Perfect place for children. 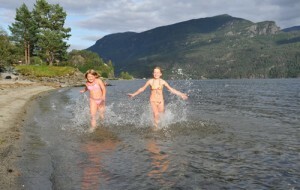 The fjord can be quite often warm and pleasant to bath in late in the summer. Close to play area and shop. 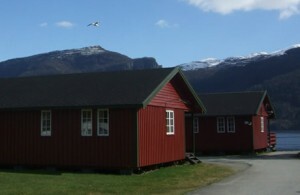 Nesøyra is a municipal outdoor activity area and is facilitated by Friluftsrådet Vest and Ryfylke Friluftsråd in cooperation with Sauda Municipality. Here you can bathe and fish. In the area, you can find remains of World War 2 constructions. There was once a weight for cargo trains and a guardhouse belonging to a NORDAG plant. From Nesøyra, you can walk along the Nes Canal, either to Sauda or to Saudasjøen.